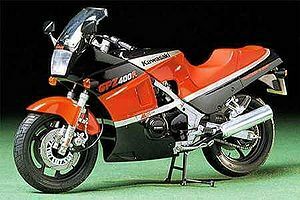 The Kawasaki GPZ400R was a 400cc, four stroke, street motorcycle manufactured by Kawasaki in 1985. The GPZ400R, a Super sport motorcycle, was dressed with a fairing, upswept exhaust, and racing seat. This page was last edited on 26 August 2010, at 18:06.